The Esmono Vocal Booth provides a great solution for recording studios where isolation between singers and performers is needed. 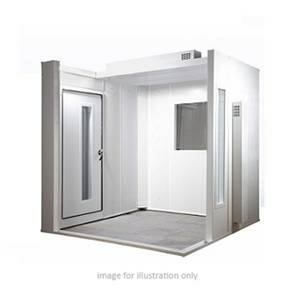 The Esmono Vocal Booth provides a great solution for recording studios where isolation between singers and performers is needed. There is sufficient room for inside this booth for one person to stand comfortably. The door can be configured to open outwards or inwards, and the hinges can be mounted to be either on the left or right. For visual communication, the door includes a window that is 1360mm (h) x 200mm (w). Additionally, you can add an optional window panel (411660) that will replace one of the standard wall panels. The size of the window is 800mm x 700 mm. Ventilation is maintained by several fan options. These quiet low-speed soft mounted fans are mounted within a fully baffled duct on a wall panel. Air can be either drawn into or out of the booth. 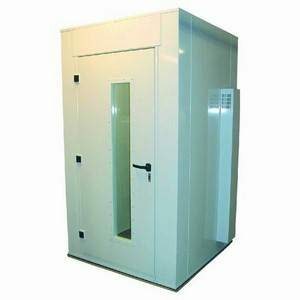 Internal Dimensions: 1200mm (w) x 1200mm (d) x 2000mm (h). CAD drawings are available upon request - please contact r.collins@studiospares.com. Please be aware that these booths are special order items and can take approximately 4 weeks to manufacture.